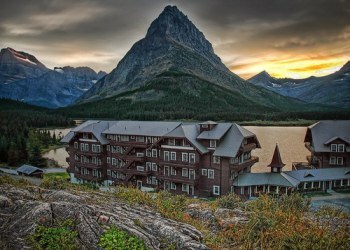 Many Glacier Hotel is a historic hotel located within Glacier National Park, on the east shore of Swiftcurrent Lake. The building is designed as a series of chalets, up to four stories tall, and stretches for a substantial distance along the lakeshore. The building has a Swiss alpine theme both on the outside and on the inside. The foundation is made of stone, with a wood superstructure. The outside is finished with brown-painted wood siding, and the window framing and balconies have wood sawn in Swiss jigsawn patterns. On the inside, the four-story lobby is surrounded by balconies, whose railings are patterned after Swiss designs. Many Glacier Hotel was built in the period between 1910 and 1915, when the Great Northern Railway was establishing a series of hotels and backcountry chalets in the park. This was part of an effort by Louis Hill, president of the Great Northern Railway and son of James J. Hill, to establish Glacier National Park as a destination resort and to promote the area as the "American Alps". To this end, Hill chose a Swiss chalet style for the hotels and chalets. 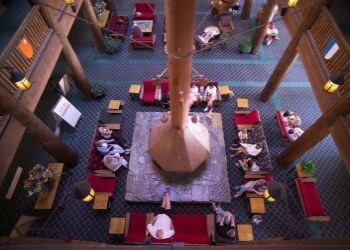 The Glacier Park Lodge (previously known as the Glacier Park Hotel) and the Many Glacier Hotel were intended to be the core structures, while the chalets and campgrounds were sited in the backcountry within an easy day's ride or hike from one of the hotels or another chalet. The chalets were intended to entice visitors to leave the hotels and see the backcountry in a more rustic manner. All rooms have double and/or twin beds, private bathroom, direct dial telephone and bell service is available. Rooms are rustic yet comfortable and spread out over five levels. Rooms are accessible via staircase. Many rooms look out over Swiftcurrent lake, other rooms have varying views of the surrounding mountain scenery. Suites are two room units that have a king bed in one room and a double in a second room. Suites offer a non-working fireplace, shared balcony, sofa and coffee table.